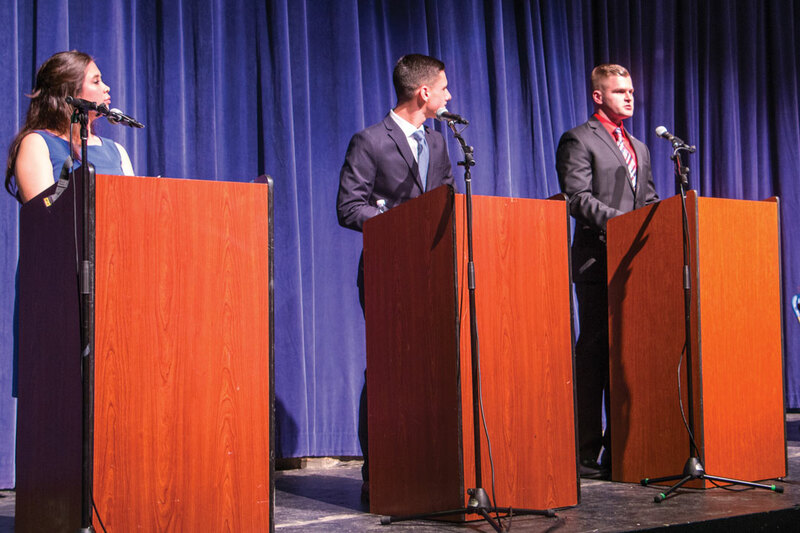 The Associated Student Government at California Baptist University hosted the annual “Great Debate” Feb. 6, at the Wallace Theatre to allow candidates running for ASCBU positions for the upcoming 2017-2018 year to present their platforms to the student body. The three students running for ASCBU executive president are Anastasia Aguas, junior political science and history double major, Kendall Morris, junior communication studies major, and Justin Post, junior political science major. Chris Hofschroer, assistant dean of students, said the event gives the executive candidates a chance to share their vision and their plan for next year. The event included a moderator from the campus publications, Aspen Taylor, junior journalism and new media major and broadcast director, who asked the candidates to take the stage and share what they would do for the student government if they were given the position. Aguas said she liked being able to voice her own opinion for the rest of the student body and to help them be more informed voters. She described herself as a driven and hardworking individual who wants her actions to inspire the student body. Actions such as a commuter lounge on the College of Health Science Campus and scantrons delivered to classes on exam days were two of the several improvements she wants to make in the 2017-2018 school year. Morris enlisted in the U.S. Army Reserve in his junior year of high school and has held the leadership positions of FOCUS leader and FOCUS intern. Morris highlighted his desire to serve the CBU community with Christ at the center of it all. Post served as a U.S. Marine for four years and mentioned the leadership qualities he learned from the Marines. Dependability, integrity and unselfishness are a few of the traits Post mentioned that he said qualify him as a worthy candidate. The two out of the four positions running unopposed are vice president for communications and executive vice president. The other two positions, executive presdient and vice president for finance, have several students running for the position. Students showed up to understand the candidates platforms and become educated voters. The polls opened Feb. 7. Each student had the opportunity to vote for Aguas, Morris or Post for the 2017-2018 ASCBU executive president position.